quarterly ISPRS eBulletin; and 6) ISPRS Book Series. 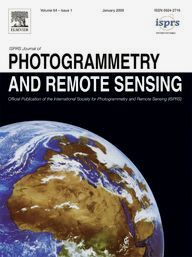 As the official publication of the Society, the peer-reviewed ISPRS Journal of Photogrammetry and Remote Sensing (IJPRS) contains scientific and technical articles and reviews in the fields of photogrammetry, remote sensing and spatial information science. Published by Elseiver B.V. and under the direction of former Editor-in-Chief, Professor George Vosselman of ITC-Twente University, from 2005 to 2012, the IJPRS improved its ISI position among the category of remote sensing journals to become the third highest impact factor in this category. As of June 2013, the Impact Factor is 2.885 with the Five-Year Impact Factor being 3.435. In 2012, Professor Derek Lichti from the University of Calgary, took over as IJPRS Editor-in-Chief and within one year as Editor he has increased the number of issues from 8 to 12 per year and the number of Associate Editors to 12 in order to meet the 25% increase in the number of manuscript submissions. Lichti has appointed a new Editorial Advisory Board of 36 members spanning all areas covered by the Journal. Special issues of IJPRS include the 2013 Volume 76, Terrestrial 3D modelling, and 2012 Volume 73, Innovative Applications of SAR Interferometry from Modern Satellite Sensors, http://www.isprs.org/isprsjournal/. The International Archives of the Photogrammetry, Remote Sensing and Spatial Information Sciences was established more than 100 years ago to contain the peer-reviewed proceedings and scientific/technical presentations of all ISPRS Congresses, Symposia and selected Conferences and Workshops. In recent years, the Archives have been published by Copernicus GmbH in digital format and made available on the ISPRS website, http://www.isprs.org/publications/archives.aspx. The Archives provide an option for authors to present interim results and work in progress that might not be mature enough to be published in the newly created Annals. In addition, the Archives feature articles that link science and industry, technology transfer and outreach. The double-blind reviewed International Annals of the Photogrammetry, Remote Sensing and Spatial Information Sciences was newly created in 2012 to raise the scientific visibility of ISPRS by providing high-quality proceedings from Workshops, Symposia and Congresses published by Copernicus GmbH. Launched for the first time at the 2012 Melbourne Congress, Annals published for Technical Commissions II, III, IV and VII, as well as the May 2013 Workshop on 3D Virtual City Modelling also are available on the ISPRS website, http://www.isprs.org/publications/annals.aspx. In future activities of ISPRS, it is expected that workshop, symposia and congress organizers will offer authors the option of submitting their presentation publications to the Annals for full and rigorous peer review in advance of the event or to the traditional Archives for peer review by the event organizers and/or external reviewers. The new peer-reviewed, open-access ISPRS International Journal of Geo-Information (IJGI) provides an advanced forum for the science and technology of geographic information. The IJGI offers an open-access opportunity for publication that is free for readers and free for authors who submit submission manuscripts in 2012 and 2013. The goal of the new journal is rapid publication of external peer-review and accepted papers immediately online. Published by MDPI AG, Volume 1 (2013) and Volume 2 (2013) papers, as well as special issues, are available at website, http://www.mdpi.com/journal/ijgi. Editor-in-Chief, Professor Wolfgang Kainz from the University of Vienna encourages scientists to publish their experimental and theoretical results in as much detail as possible. There is no restriction on the length of the papers and already there have been eight special issues. The quarterly ISPRS eBulletin, formerly the ISPRS Highlights, is the official bulletin of the Society that is compiled and composed by ISPRS Secretary General Professor Christian Heipke. It contains general news of ISPRS activities such as event reports of ISPRS sponsored conferences, lists of officers, keynote speeches, book, project and technology reviews, minutes of Council and Technical Commission meetings, Calendar of Events and calls for papers. The ISPRs eBulletin is widely distributed via email to the individuals of ISPRS Ordinary Member national remote sensing societies. Past and current eBulletins also may be downloaded from website http://www.isprs.org/news/newsletter/default.aspx. monographs providing in-depth study on a specific topic. Descriptions of previously published ISPRS Book Series volumes are listed on the website, http://www.isprs.org/publications/bookseries.aspx. The Helava award, sponsored by Elsevier B.V. and Leica Geosystems AG, is a prestigious ISPRS Award, which was established in 1998 to encourage and stimulate submission of high quality scientific papers by individual authors or groups to the ISPRS Journal, to promote and advertise the Journal, and to honour the outstanding contributions of Dr. Uuno V. Helava to research and development in Photogrammetry and Remote Sensing ..
ISPRS wholeheartedly congratulates IGN/CNIG to this significant success. During the recent Interexpo Geosibir Meeting in Novosibirks, Ammatzia Peled from the University of Haifa, Israel, was awarded the title of Honoray Profefssor of the State Academy of Geodesy. Ammatzia received this prestigeous recognition for this tireless efforts to organise a sumemrschool between the three centres of geospatial education in Moscor (State University of Surveying and Mapping), Wuhan and Novosibirsk. The Society for Photogrammetry and Remote Sensing (SFDP) of the Czech Republic awarded Professor Gottftried Konecny an honorary membership. Prof. Konecny received the award from Lena Halounová, chairperson of SFDP and ISPRS Congress Director, and Karel Vach, Vice President of SFDP. 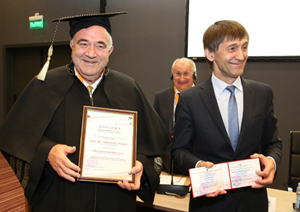 The honorary membership was awarded for his contribution to the world development of photogrammetry, remote sensing and spatial science and to his outstanding effort in international cooperation which made him one of the most important successors of Eduard Doležal. 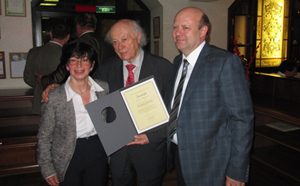 The award was given to Prof. Konecny during the gala dinner organized by the Siberian State Academy of Geodesy (SSGA) in Novosibirsk in Russia 24 April 2013. The Gala dinner was one of the social programme parts prepared for participants of the IX International Exhibition and Scientific Congress "Interexpo Geo-Siberia-2013" and ISPRS WG IV/2 Novosibirsk Workshop 2013: Global Geospatial Information. Racurs Conference "From Imagery to Digital Map: Digital Photogrammetrc Technologies"
The EuroCOW is a biennial event organized by the Institute of Geomatics on behalf of the EuroSDR (European Spatial Data Research) Commission I: Sensors, Primary Data Acquisition and Georeferencing, and also on behalf of the ISPRS (International Society for Photogrammetry and Remote Sensing). For the next edition, it is the Intercommission Working Group III/I: Sensor Modeling for Integrated Orientation and Navigation that is in charge. See here for more details. SPIE Optical Metrology - "Videometrics, Range Imaging, and Applications XII"
ISPRS Hannover Workshop "High Resolution Earth Imaging for Geospatial Information"
The IX international exhibition and scientific congress INTEREXPO GEO-SIBERIA-2013 - "Advanced Geospatial and Surveying Technologies for Environmental Management and Sustainable Territorial Development"
ISPRS mourns the loss of its Honorary Member and former ISPRS President Dr. Frederick J.Doyle. Fred Doyle passed away on April 17 at home. ISPRS mourns the loss of Dieter Zeuner. Dieter passed away on March 17 at Newmarket, ON, Canada.